Louis Breguet, a pioneer of French aviation, is probably best known for the series of bombers and airliners built by the company he founded in 1911, for founding the airline that became Air France, and possibly for winning a bronze medal in yachting at the 1924 Olympics. But before all that, he was fascinated by the potential of rotary flight – the helicopter. 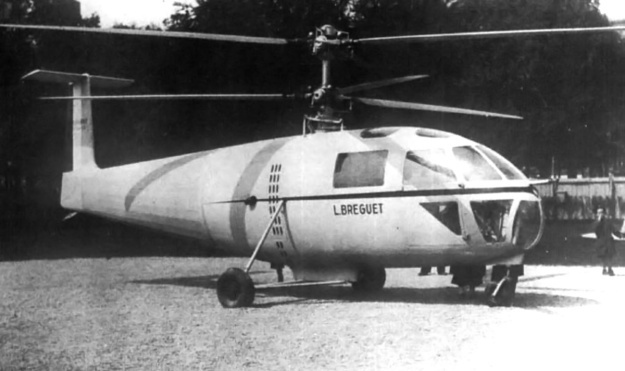 Breguet built an early helicopter, which he called a gyroplane, and managed to bring it a little less than one meter off the ground – noted as the first flight by a helicopter with a pilot, even if the pilot could have easily stepped on and off the aircraft. Soon afterwards he began designing fixed-wing aircraft, having great success with a line of all-metal airplanes. Many Breguet designs served France during the Great War. He returned to his first love in 1931, laboring with Rene Dorand to create a new helicopter. Their naked steel-frame Gyroplane-Laboratoire had two contra-rotating rotors, powered by a single engine, and made its first flight in 1935. The machine performed well, and the two engineers continued to make improvements even after Dorand left to form his own gyroplane company. Their helicopter suffered damage in a June 1939 landing, and had not finished repairs when war broke out in September. The new conflict ended work on the prototype, which was destroyed by Allied bombing in 1943. 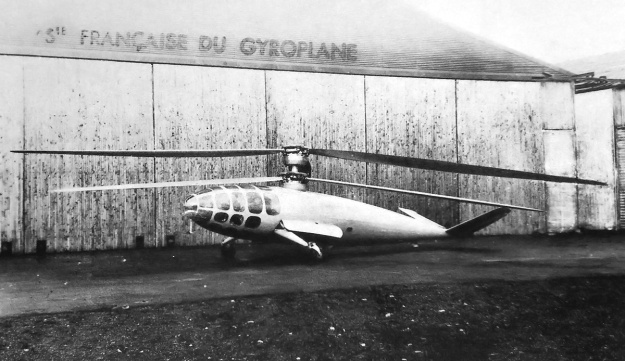 In 1938 the French Navy commissioned Dorand to create a new helicopter, one capable of performing anti-submarine patrols and also attacking enemy surface craft and submarines in a coastal-defense role. It may have also been intended to operate from the massive cruiser-submarine Surcouf and her projected sisters, since the proposal also that the helicopter could be disassembled for stowage. Those parameters would require a far more capable machine than anything previously built or even designed, but Dorand responded to the challenge. He drafted a helicopter with a radically different appearance than the Gyroplane, an innovative new craft a decade or more ahead of its time. Internally the new machine, designated the Dorand G.20, drew heavily on the Gyroplane’s best qualities – the steel frame and the pair of contra-rotating rotors, this time with three rather than two blades, driven by a single shaft. Externally it resembled nothing that had flown before, or since. The fuselage consisted of a long, narrow cigar somewhat similar to that of a fixed-wing aircraft, but with no wings. A sketch of the G.20. 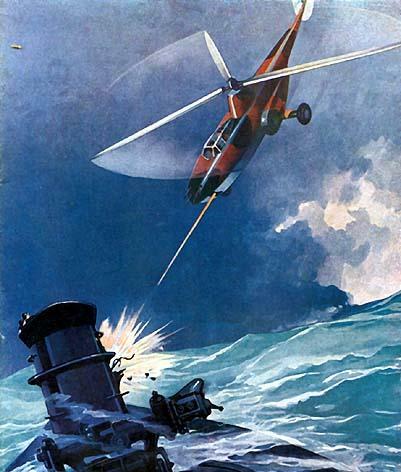 The original design sketches gave the craft a pair of machine guns: one fired to the left and rear of the machine from a side position, and the other mounted atop the rotors and manned by a crewman who stood in a tube leading through the rotor hub into the crew compartment. An enclosed bomb bay held several bombs – just how many and of what weight apparently was never determined, though in its anti-submarine role the helicopter would have carried a single depth charge (the standard French depth charge carried by small warships weighed 52 kilograms, or 115 pounds, with an explosive charge of 35 kilograms). Apparently wishing to improve the craft’s range and performance, Dorand eliminated all of the armament and reduced the crew from three to two. The G.20 would now fill only the recon and liaison roles, as well as carrying mail. Taking out the central tube and streamlining the fuselage probably would have helped along with the reduction in weight. However, the design retained the now-empty bomb bay, so the depth charge could easily have been re-inserted. The picture on the right, from the December 1945 issue of the French magazine Science et Vie, shows a very stylized G.20-like machine that differs in key details. Unlike the earlier Gyroplane, the G.20 had two engines, one driving each rotor. Should one fail, the other would automatically kick in to drive both of them. Each engine had the same power output as that driving the Gyroplane, giving an expected top speed of 250 kilometers per hour (155 miles per hour) and a range of 800 kilometers (just under 500 miles). Those exactly met the French Navy’s specifications; what Dorand really thought of his machine’s capabilities is difficult to determine. The entire cockpit was enclosed by plexiglass, giving a very wide view, while the rest of the machine had a metal skin. The control surfaces on the butterfly tail fin were covered in cloth. The helicopter had no tail rotor, depending on its dual main rotors for stability. The two-part rotors were made of magnesium. The two main wheels and the small tailwheel retracted inside the fuselage, behind gear doors that lay flush against the helicopter’s body. The lone G.20 prototype, consigned to the island of misfit toys. Construction of a prototype began in 1940, and proceeded slowly thanks to the war and Dorand handing off the project to another lead designer. The Germans inspected the helicopter and declared themselves uninterested in the design, allowing Dorand’s firm to continue their work. Not until 1947 did the prototype emerge from the workshop, and by then the French Navy had lost interest in the craft and cut off the long-promised funding. Though looking like something out of a science-fiction pulp magazine, the G.20 had a number of now-obsolete features thanks to its origins in the old Gyroplane design. No test pilot would volunteer to take the strange helicopter aloft and the G.20 never flew; the lone prototype would be scrapped soon afterwards. Undeterred, Dorand re-united with Breguet to design a new helicopter combining the positive features of the G.20 – notably, the dual rotors and tailplane in place of a tail rotor – with German and American developments that had taken place during and after the war. The new G.11e could carry four passengers but proved underpowered when it flew in 1949; a new version with a bigger engine called the G.111 made successful test flights in 1951 but Dorand’s firm entered bankruptcy the following year and the helicopter died with the company. Dorand and Breguet's post-war G.11e. 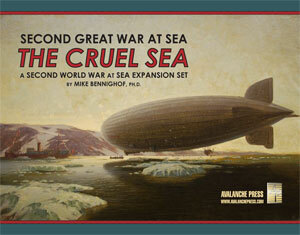 In Second Great War at Sea: The Cruel Sea, the French receive the G.20 in its original intended role as a shore-based reconnaissance machine, without armament. It’s a capable little machine compared to German and Russian helicopters, with better range than their equivalent machines (the Fl.282 or Mi.1), but without a helicopter carrier the French can’t take them to sea. We’ll have to remedy that in the next volume.